If an outdoor living space is in your plans, you are not alone! According to the American Home Furnishings Alliance (AHFA), eighty percent of Americans plan to purchase outdoor furniture or accessories this year. Hearing their call, manufacturers are producing beautifully designed outdoor furniture collections made to handle all that Mother Nature can offer. 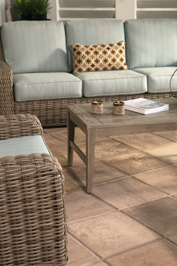 Not surprising therefore that outdoor living products represent the fastest growing segment of the furniture industry. With the introduction of fade resistant fabrics, durable structural materials such as cast aluminum, teak, Ipe and much more, outdoor living is highly desirable and easier than ever. Add fire features like rust resistant fire pits, high performance gas or charcoal grills, a brush of color with throw pillows and other fabric accents, and voila, your outdoor living space is a year round destination for family fun, entertaining friends, or simply for quiet enjoyment and relaxation! Is your outdoor living space ready for summer? No worries, we have your back. Our blog will provide you with insightful tips to help you avoid the common pitfalls associated with creating inviting, stylishly comfortable outdoor living spaces. Check out the first step to building your outdoor space!